The Democratic Alliance appears to be in an awkward place of limbo right now that is difficult to explain beyond its race relations identity crises. If you look closer, you find the party suffering from its ‘sins of incumbency’ – which is what happens when you transition from pointing the finger to being pointed at. After many stones thrown, the glass house has cracked and the party does not have much time to fix it. For a long time, the DA was politically self-righteous. Despite the big difference in electoral support between it, as the official opposition, and the ANC as the ruling party, it was a force to be reckoned with – they were effective and they were stinging. But post Jacob Zuma-politics has been a big change for all political players in South Africa, no less the DA. 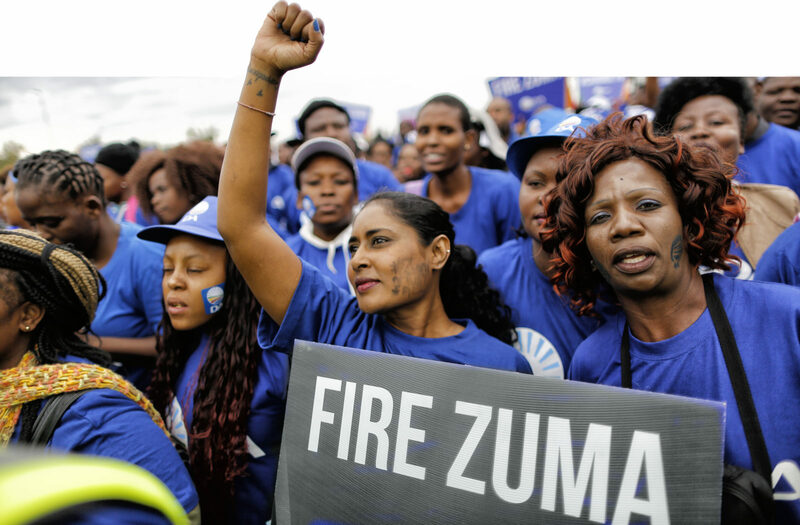 Since Zuma was unceremoniously despatched back to Nkandla in February, the DA found itself stumbling at its feet, unsure of itself and perhaps facing an identity crises. And they can’t dump it entirely on the drama surrounding embattled Cape Town Mayor Patricia De Lille. When analysing the DA, it is tempting to focus entirely on race relations because sometimes they make it so easy to do. But a closer glance will expose a party beating a dead horse, trying hard to win some of the political scores they used to gain so easily – and it’s not working any more. Take what happened in the North Gauteng High Court this week. The DA is persisting in its fight to make Zuma repay whatever the state spent for his legal fees. They have done their homework and they make a compelling argument. But they did not envision the President, usually their stubborn opponent, giving up any defence and instead, filing a motion to abide by whatever ruling the court makes. But, the Presidency said in a media statement, it intends to submit an explanatory affidavit to “assist the court in understanding the history, legal basis, rationale and processes relating to the provision of this (legal) support”. “Public coffers should not be bled dry to cover the legal fees of one man’s actions, these commitments by the Presidency are a victory for democracy and accountability,” he said in a statement. In the politics of Zuma days, the DA would have filed this motion, the President would have offered a stubborn response. Then there would typically have been a series of delays before the matter was heard and the president would presumably have withdrawn his opposition at the last minute on realising he would lose the case. All the while, the DA would have scored massive political mileage, with media being suitably impressed by their tactics and their results. A similar argument about just how strongly the winds have shifted can be made in a separate court case where the DA is challenging President Cyril Ramaphosa. Last week, the DA had to approach the South Gauteng High Court after its efforts to get direct access to the Constitutional Court failed. They are challenging the appointment of Arthur Fraser as the National Commissioner of Correctional Services after being moved as Director-General of Intelligence. While they may have a formidable case against Fraser, that is not all they wanted. They also wanted the Constitutional Court to rule that Ramaphosa violated the Constitution by making the appointment – a legal battle they already once won against Zuma. But the court essentially found that the DA’s argument was not compelling enough to allow for direct access and it was struck out. They now have to argue the matter to a lower court. Legal merits aside, it seems like the DA is so used to the low hanging fruit that was Zuma’s prolific legal delinquency that they are now left wanting. The “sins of incumbency” plaguing the DA arguably intensified when they took over key metros across the country. The 2016 electoral victories of the DA were meant to be the rehearsal dinner before the big dawn of the 2019 election showdown. With the metros under its belt, the DA was due to put on a spectacular show which would depict what a DA national government will look like. It has been the polar opposite, so far. Maintaining good relationships with coalition partners has become a nightmare and, worse, the reality of governance has now overshadowed their dreams of delivery. The DA has been banging its head over why the Marietha Aucamp scandal in the Tshwane municipality has caused such a stir. Almost a week on, the DA is still on the defensive, with the ANC in Tshwane ironically (and rather hilariously) calling Aucamp the “Hlaudi” of the DA. Aucamp was Mayor Solly Msimanga’s political senior who had been in the municipality as DA chief whip for years. With the fragile coalition in place, the DA needed someone in the mayor’s office who was experienced and she was the right fit for the chief of staff position. That’s how they explain it at least. But the R1-million per annum position came with a job requirement that Aucamp did not meet but somehow she still made the cut. It later turned out that she may have falsified her qualifications for the job. The ANC is now doing what the DA usually did for so many years. It found cheap political points to score and it is running with it. Calling her “Hlaudi” in reference to the beleaguered former SABC chief operating office Hlaudi Motsoeneng, who falsified his matric qualifications, just adds to the spectator value of the scandal. In essence, the DA was caught in a situation it once held the moral high-ground on. It was reminiscent of when news emerged that telecommunications minister Siyabonga Cwele hired Zuma’s daughter, Thuthukile, as his chief of staff. Although she met the qualification criteria, there was an uproar over her lack of political experience for the high-paying job. The DA had a field day with it at the time, arguing that political connections should not result in top jobs in the state. Cwele and the ANC defended the decision saying the position of chief of staff was a political appointment and the rules of ordinary civil servants don’t apply. Ironically, the DA has now made the same argument about Aucamp, in direct opposition to what they stood for some years earlier when opposing the Thuthukile appointment. In the same breath, for years the DA has accused the ANC of allowing factional fights to get in the way of governance. The party has now fallen victim to this phenomenon in the City of Cape Town. This week, the dramatic fight between Patricia de Lille and the DA leadership dragged on in court while De Lille holds on to the little power she has left as mayor. In vicious exchanges of court papers, De Lille accused the DA of trying to use an unlawful short cut to get rid of her while the DA argued De Lille cannot force the DA to stay in a broken relationship. The legal turn to the De Lille crisis means real governance in the city that is still on the verge of water catastrophe will hang in balance for a while before it is eventually resolved. This situation is as a result of the party being sanctimonious when it went from being the opposition in Cape Town to being in charge through a fragile coalition to later becoming firmly in charge with about a two thirds majority. While they often chose to grandstand in the face of ANC factionalism, the DA failed to pre-empt this within itself. The chaos surrounding De Lille can be attributed to many things – but the most ignored element is factionalism borne of a competition for access to resources. Many pundits have spoke about the DA’s several “own goals” recently, which is not incidental nor random. The political terrain has changed and the DA’s position in the party-political arena has shifted too. At the risk of invoking ANC jargon, the DA has failed in properly formulating its strategy and tactics in a new (dawn) political era. It is a growing party which now sits on more governing benches then before. The party became so comfortable in its role in the torrid politics under Zuma that it has failed to renew itself since. They may be angry about “Ramaphoria” among the chattering class but it would be naive to blame a wave of excitement over a new president for their own substantial woes as a party (in office in local government and in opposition).